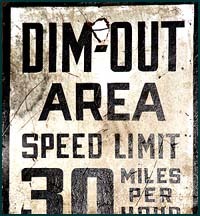 WWII security sign, banning headlights and other illumination that lighted a potential target. these yards had to continue with no respite. 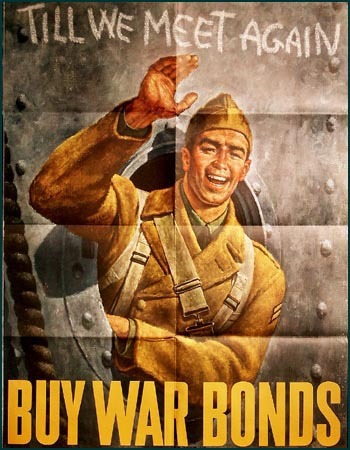 The war against Japan in the Pacific still loomed with many uncertainties; ships still had to be launched and sent out past the Seguin and Portland Head lights to distant dangerous waters. 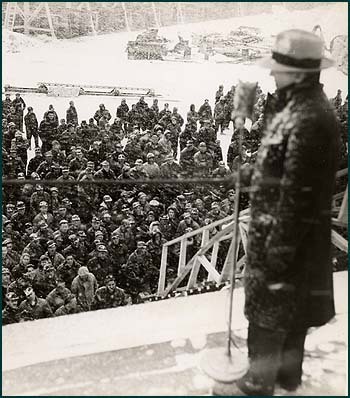 What became known as the Home Front would continue in Maine's shipbuilding towns as it had grown since the beginning of the war, three shifts around the clock, winter and summer, good weather and bad. Shift change transportation line-up in Bath. Diverse labor pools of older, younger, unskilled, and female workers had come together as the pace of the ship-building accelerated. 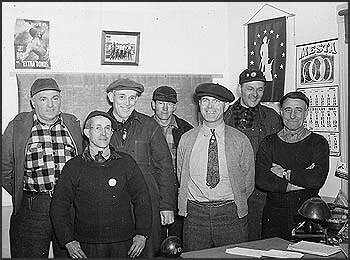 Hitherto small, coastal communities filled with thousands of new welders, shipfitters, pipefitters, draftsmen, electricians, tin knockers, and carpenters. 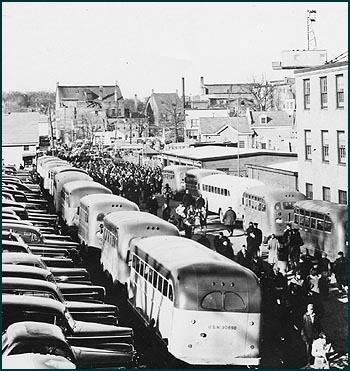 Commuting became complex; stores stayed open all night; housing was tight. 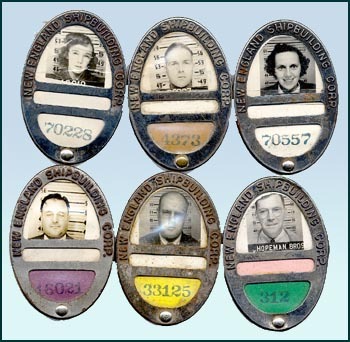 Identification badges for workers in the New England Shipbuilding yard, South Portland. 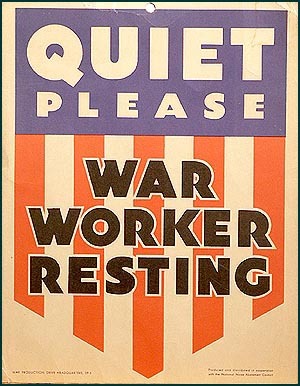 Sign for the lodging of a third-shift worker, the after midnight "graveyard" or "lobster" shift. 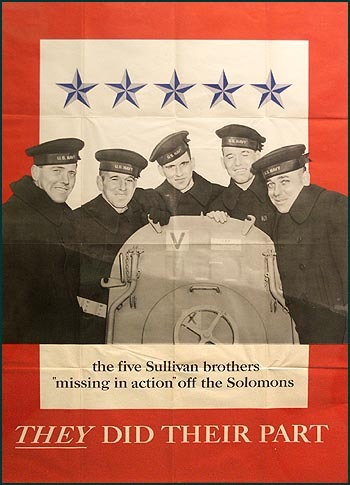 The extreme sacrifice of the Sullivan family, losing five sons stationed in the Pacific on the same ship, became a watch-word for staying the course at home, as in this morale-stiffening 1943 poster. A new naval vessel, the Bath-built U.S.S.The Sullivans (DDG-68), was commissioned in April of 1997. 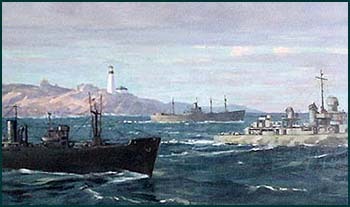 Submarine activity threatened convoys that assembled in Casco Bay outside of Portland harbor; throughout the war U-boats were being traced and sighted alongMaine's rambling coastline. The submarine patrol craft U.S.S. 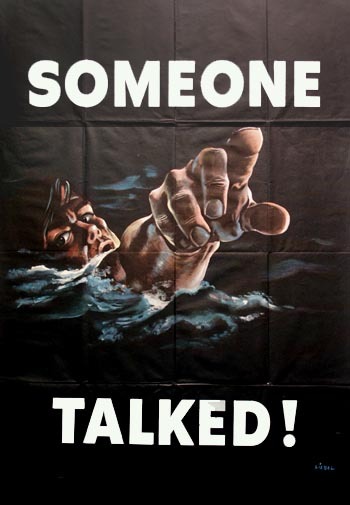 Eaglewas sunk by U-853 off Portland two weeks before the German surrender; this U-boat never received the German admiralty order to cease hostilities, and continued to sink shipping until it was destroyed off Point Judith, Rhode Island, on May 6, 1945, the last naval engagement of the Battle of the Atlantic. 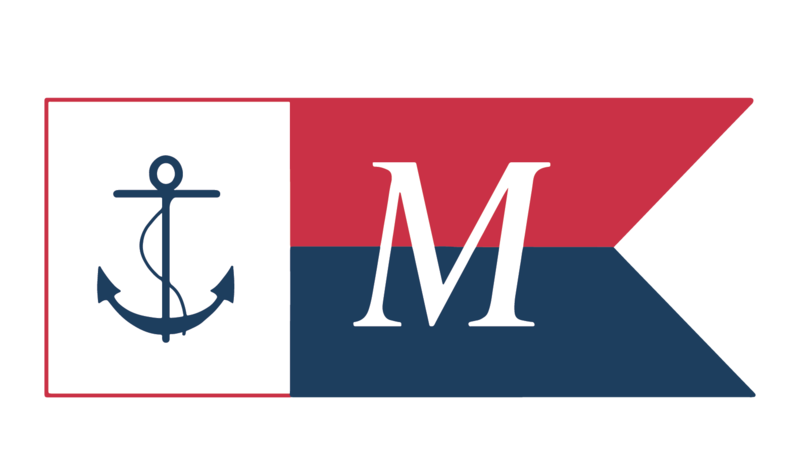 The Victory Fleet had grown to more than 3400 American flag merchant ships supplying the war effort by the time Victory Fleet Day was declared on September 27, 1944. 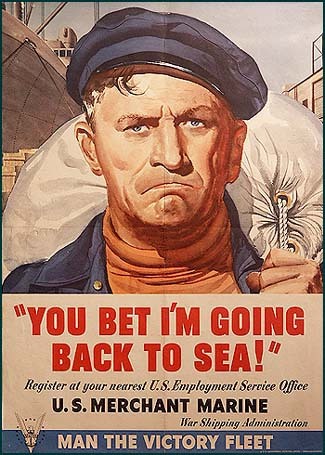 The above poster was printed in 1942, in considerably more uncertain days for merchant-shipping due to sinkings, and before the Liberty-ship yards on both coasts were in full swing. The reverse of this "Newsmap for the Armed Forces, for the 245th week of the war, the 127th week of U.S. participation," is printed with details of the Allied Italian, Chinese, and Pacific campaigns in the spring of 1944. 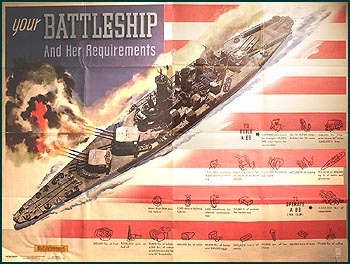 6250 shipbuilders took 3 ½ years to finish this Missouri-class battleship. 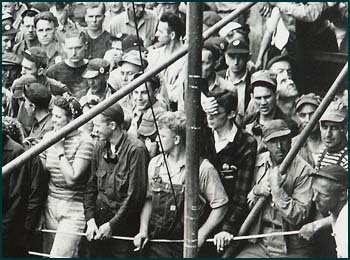 Shipyard workers at a Bath Iron Works destroyer launch, mid- 1940's. Launchings were quicker in Maine. 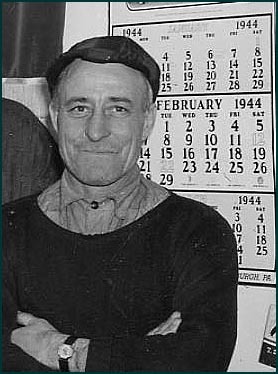 274 Liberty ships were built in four years in South Portland; a new destroyer reached the Navy every 17 days during the 1943 - 1944 peak production at Bath Iron Works. 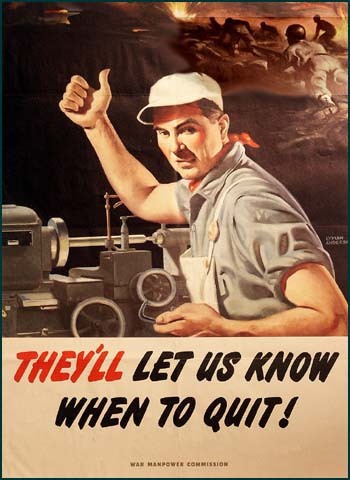 These production achievements have become local legends, connecting the pride and dogged effort of coastal Maine with the global sweep of the war.